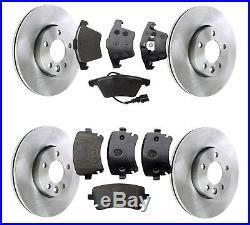 FRONT AND REAR BRAKE DISCS AND BRAKE PADS FITS VOLKSWAGEN TRANSPORTER T5. 1 Front Brake Pad Set. 2 Front 308mm Vented Brake Discs. 1 Rear Brake Pad Set. 2 Rear 294mm Vented Brake Discs. If unsure of fitment please message us with your registration number. The item "FRONT AND REAR BRAKE DISCS AND BRAKE PADS FITS VOLKSWAGEN TRANSPORTER T5" is in sale since Tuesday, February 27, 2018. This item is in the category "Vehicle Parts & Accessories\Car Parts\Brakes & Brake Parts\Brake Discs". The seller is "sjbautomotive" and is located in Manchester. This item can be shipped to United Kingdom.